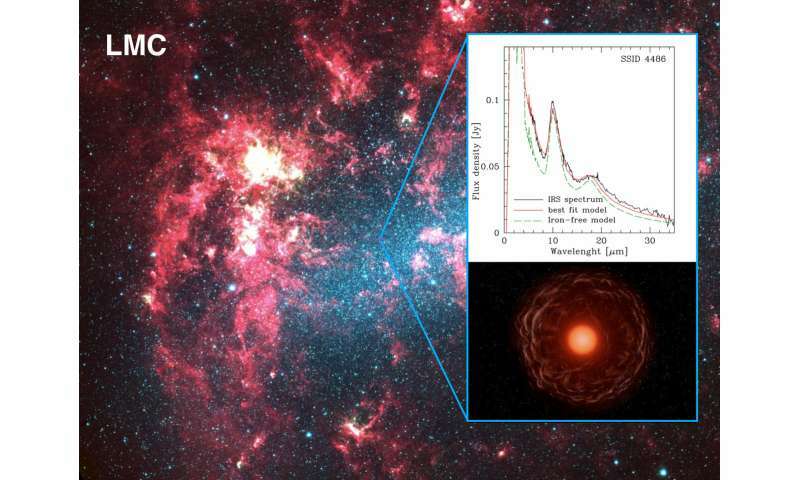 The Instituto de Astrofísica de Canarias (IAC) has participated in the discovery of a group of metal-poor stars shrouded in a large amount of iron dust situated in the Large Magellanic Cloud. This study involved a combination of theoretical models of the formation of dust in circumstellar envelopes with infrared observations taken with the Spitzer Space Telescope. The work includes predictions for the future James Webb Space Telescope. Stars with masses between one and eight times the mass of the sun evolve along the asymptotic giant branch (AGB) before ending their lives as white dwarfs. It is during this rapid but crucial phase when the stars expand to huge dimensions and cool down, losing a major fraction of their mass due to strong stellar winds. The low temperature and high density of the winds provide ideal conditions for the condensation of dust grains in their circumstellar envelopes. The dust produced by the stars in their AGB phase and expelled into the interstellar medium is important for the lives of the galaxies, because it comprises an essential component for the formation of new stars and planets. Characterising whether the dust is composed of solid state organic components or inorganic components and determining the quantity of dust is important to the astronomical community. Astrophysical Journal Letters has published the new study, which has answers to the puzzles of a peculiar group of massive AGB stars situated in the Large Magellanic Cloud. Comparing the infrared observations made with the Spitzer Space Telescope (and predictions for the future James Webb Space Telescope) with the theoretical models developed by this group, the study reports that these stars weigh around five solar masses, were formed around 100 million years ago, and are poor in metals such as iron, magnesium and silicon. Unexpectedly, the researchers discovered that the infrared spectral energy distributions can be reproduced only if iron dust is the principal component of their circumstellar envelopes. This is uncommon around massive AGB stars. It was previously known that such stars mainly produce silicates, magnesium and large quantities of oxygen and silicon. But this finding is even more surprising, considering the metal-poor environment of the stars under study. The study characterizes for the first time this class of stars with unique spectral properties. "The low metallicity of these giant stars creates peculiar conditions, permitting the formation of large quantities of iron dust," explains Ester Marini, the first author of the article and a doctoral student at the Roma Tre University. "In fact, in metal-poor environments, the complex nucleosynthesis within massive AGB stars is so advanced that it burns up almost all the magnesium and oxygen, necessary to form other types of dust such as silicates." Under these particular conditions, iron dust becomes the main component of the dust formed by these stars. "This result is an important confirmation of the theory of iron dust in metal-poor environments, already hinted at in independent observational evidence," says IAC researcher Aníbal García Hernández, a co-author of the work. "The arrival of the James Webb Space Telescope (JWST) will open up new possibilities for investigating this case in depth," says Flavia Dell'Agli, a postdoctoral researcher at the IAC and second author of the article. "That future telescope will greatly enhance the number of resolved extragalactic AGB stars," she says, adding that the MIRI instrument on the JWST will be "ideal for identifying this class of stars in other galaxies of the Local Group." Hmmm... these big stars are iron poor because they used up their used up their magnesium and oxygen. OOPS, no, they produce silicon and magnesium and oxygen. Well, one assumes this is the second go-round for this batch of stars exhausted by their ejection of metals and so the metal -poor stars LOW TEMP stars don't have much to offer except a cloud of iron dust. Supposedly the magnesium and oxygen has already been burnt up. Do they write these just to confuse the general public? Or to keep the report at a hint level so the James Webb can take center stage and 'discover' all this later? My assumption is that there was a metallic star in the same area, massive enough to blow out. Resulted in the cloud of iron molecules. In random proximity to these present low metallic stars. Just a coincidence of improbable affiliation. It sounds like some civilization is mining stars out there. Why jeff? Why would you make such an assumption first? Simple natural functions for this phenomena. Obviously aliens would not have come from the low metallic stars. Iron is nice for our primitive industries but with all the nickel-iron rocks flying about? Collecting Iron dust sounds like a very unprofitable source. If we were really, trully interested in detecting space-going metal-industrial civilizations? We would be concentrating on the high-metal star clusters. Attempting to detect major signals & ship wakes from where there would be concentrations of the industrial facilities, hubs of transportation routes & high-powered communication leaks. Those would be prime opportunities for metal-consuming technologies. In addition to the greatly increased potential of contacting other civilizations to exchange ideas & knowledge. These metal clusters might possibly be the oasis for caravans crossing the wastelands of Space. The best place to mine might be in the remnant ejecta from the collision of two neutron stars.